Ask fellow campers about "Robbins Nest RV Park" and nearby attractions. Rate is based on month's stay. Our preferred place to stay when visiting the Bandon Area. 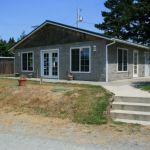 Easy access to Highway 101 and close to Bandon and seaside parks. Level gravel sites are extra long; although sites are fairly close, the length allows rigs to be staggered for extra room. Without doubt the best park internet we've ever experienced. No obstructions to TV satellites, little OTA, and digital cable kits available on request. Verizon cell/data were strong. Some long-term residents, but their sites are well maintained. This isn't a resort, just a safe, reasonable, and comfortable place to stay. The owners are attentive and helpful; as one other Rver said "it's like camping in a friend's back yard". We'll stay here again. We camped at Robbins Nest RV Park in a Motorhome. 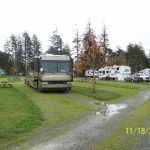 RVers should be aware that this campground has a strict, 30 day, no refund, cancellation policy. We had to reschedule our trip and gave 12 days notice. Lost our $40 first night deposit. We did not stay here but at another RV Park on our schedule. We did visit here to see what we lost for the $40 and have to agree that the August 2018 review is very accurate. We camped at Robbins Nest RV Park in a Travel Trailer. Stayed based on previous reviews...must have been a different park. This is an old somewhat maintained park directly off Hwy. 101. You hear every bit of traffic. It is primarily dirt, gravel, brown grass, and green weeds. There are a few trees and some planting's that could use a little care. The "lawn" area has some junk and landscaping debris dumped in the corner. Sites are mostly long pull throughs. Bathrooms were ok. Did not use showers. Did not find the owners especially warm and welcoming. We were met by an owner at arrival and told to get parked and come in to complete registration. We were getting risers placed on one side of the trailer to level and utilities at a proper distance, when she came back out and insisted we come in to complete registration. We left it and I went in to register. The speed within the park is 5 mph coming off Hwy. 101 at 55 mph. Apparently, I exceeded the 5 mph at one point, because I received a reprimand by email. The pros include very long sites for bigger rigs and decent WiFi. I doubt we will stay here again. We camped at Robbins Nest RV Park in a Fifth Wheel. Small park but very well maintained. Owners on-site and are very welcoming and accommodating. We camped at Robbins Nest RV Park in a Fifth Wheel. 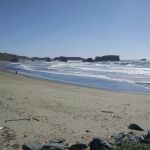 Is a few miles outside of Bandon but close to beach access and our of the wind. We just completed 2 months here and had a great experience. As has been stated earlier, this is a small (20 sites) gravel/grass park with some long pull throughs. The owners are great and stay on top of things. Power is good and wifi is good. They also provide cable TV via a box you'll need to hook up (not difficult) Verizon reception was also good. It's just a couple miles South of Bandon. You're about a mile from the nearest state beach access. Understand, if you're looking for all the upper end bells and whistles (pool, spa, etc), this isn't it. But if you're looking for a comfortable, well run and reasonably priced base of operations, this is for you. We camped at Robbins Nest RV Park in a Fifth Wheel. If you enjoy day trips this is an excellent location for visits to old town Bandon, Coos Bay, Reedsport, Florence, Roseburg and Brookings. Owners have a good knowledge of the area and maintain a binder in the club house of local restaurants and attractions. Relaxed quiet park. Efficient utilities, clean and controlled grounds, great washrooms and free shower with tons of hot water. Strong, fast WiFi and friendly, helpful owners who live onsite. Pull through for small or large rigs. Safe, well lit at night and close to town. Community room with TV and laundry. We camped at Robbins Nest RV Park in a Travel Trailer. Tony's Crab Shack in Bandon was reasonably priced and very tasty. This was a great find. Located on the outskirts of Bandon, OR. Robbin's Nest is a small, extremely well run park. Pull throughs are long and spacious. Well maintained gravel and grass spaces. Internet is good. The best part is the owners. The current owners purchased the park 2 years ago after camping for 25 years and staying at the park. They know what works at an RV Park. We were invited to their 2 year anniversary barbeque. They supplied hamburgers, hot dogs, and barbeque chicken along with drinks for 34 people. It was a terrific night. The community room was stocked with a personal album designed for local sightseeing and things to do. More personal touches. Pets are welcomed and lots of place to walk the dog. The park is about 4 miles out of town and well worth the drive. Just minutes from the ocean and beaches. And, at night, the sound of the ocean and nothing else. 20 degrees cooler than inland. We will go back! We camped at Robbins Nest RV Park in a Motorhome. Bandon Farmers Market was terrific. Walking and shopping in downtown Bandon nearby. Charleston fishing village a short distance with fantastic seafood just out of the water. Crab season can't be beat! State parks are nearby. Shopping within minutes. All of the previous comments are spot on. Owners could not have been more helpful. One called her friend in Port Angeles to help us find the best route. They were both there immediately to help set up the cable. You just feel comfortable. The cable hookup is a little wonky, but they are right there to help get it done if you have any issues. We camped at Robbins Nest RV Park in a Motorhome. Take a drive around Beach Loop drive. Take a walk on one of the many beaches. Go to old town and have chowder at Bandon Fish Market. The stores close up pretty early, 6:00ish. Rate is based on monthly stay. As long-time full timers, we're always looking for a perfect park, and this is as close as it gets. It starts with the owners; friendly, helpful, and concerned with the quality of your stay. The location is perfect; three miles from the center of the picturesque town of Bandon and convenient to the beach. At night, you can hear the surf pounding in the distance. The sites are long, level pull-thrus with table, and the hookups are conveniently located. The park is along Highway 101, but the is fenced for privacy and noise reduction. The community room is furnished with TV, washer/dryer, game table, lending library and lots of local information. For once, we had an entire stay with strong, consistent WiFi, along with good Verizon cell and data. The park furnishes the equipment free for digital HD cable with multiple channels, and access to TV satellites is easy. Not a resort, just a great place to stay with great owners who take an interest. We'll be back. We camped at Robbins Nest RV Park in a Motorhome. Bandon has a number of great shops and restaurants. Don't miss Cranberry Sweets, where you can graze on samples until your blood sugar peaks. Face Rock Creamery has house-made cheeses and huge helpings of ice cream - get the "childs" size. A nice boardwak on the waterfront has interpretive signs and sculptures, and a trip to the jetty provides great scenery and access to the beach. Make a visit to Face Rock overlook and Coquille point for incredible views of the offshore rocks. Very pleasant park. Small but very neat and clean. Outstanding WI-FI!!! The owner was very nice and helpful on local information. Sites were very large. AT&T cell service was perfect. We camped at Robbins Nest RV Park in a Motorhome. West Coast Game Park Safari. A must stop. Lots of animal petting and holding. The current owners have owned the park for a year. They were very friendly and helpful - we needed to adjust our TV for the park's cable and they both came to the unit to solve our problem. The place is quiet, the neighboring campers friendly, the mostly pull-through sites level and not crowded together, and the community room well maintained and stocked with a large exchange library. We would be happy to return. We camped at Robbins Nest RV Park in a Motorhome. A pleasant used book store is adjacent to the park. A small park with nice, long pull-through sites. We were staying a couple nights and this location worked out well. Getting in can be a little tricky due to the fence, so give yourself plenty of room to turn in. The owner is extremely friendly and helpful and very welcoming. It's not a fancy park but met our needs with good utilities, ability to get satellite, extremely fast Verizon data services including our air card and good cell service. Easy access to Bandon. Hwy 101 is quiet at night even though we were right on the highway. We would stay here again. We camped at Robbins Nest RV Park in a Motorhome. The West Coast Game Park in Bandon is a must see if you like animals. They have several baby wild animals (bobcat, snow leopard, fox, possum, ferret, bear) that you can either pet or hold, as well as many others on exhibit. Lots of fun. A small park with easy access to highway 101 and convenient to Bandon. Interior roads and sites are gravel with extra long pull-thrus, grass, fire ring, and picnic table. Very friendly and helpful host checked to see if our stay was comfortable. Fenced and very quiet at night. Verizon cell/4g were strong, and there were no obstructions to rooftop satellite. A convenient, quiet, and reasonably priced stay for an overnight or longer; we'll visit again. We camped at Robbins Nest RV Park in a Motorhome. 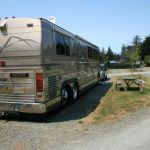 Are you affiliated with Robbins Nest RV Park ?